Clean the salmon fillet for fat and impurities. Cut off possible “ugly” ends. Place the salmon in a tray with the meat side turning upwards. Mix salt and sugar in a bowl and spread the mixture on the upper side of the salmon. Cover the salmon and place it in the fridge for two days. Turn the salmon after 24 hours so the meat side is placed downwards in the salt and sugar mixture. The salt and sugar will “melt”, thereby marinating the salmon. Wrap the salmon in plast foil after the two days and place it in the freezer until you serve it (minimum 12 hours to kill all germs). Chop celery and apple finely and mix it with the sour cream. Season to your taste with sherry vinegar, salt and pepper. Cut the skin from smoked salmon (or from the cured salmon) in thin slices. Heat some cooking oil, e.g. rapeseed oil, in a shallow pan and fry the skin for two to three minutes till it is crisp. Leave the skin to cool off till you use it. Thaw the salmon and slice it into thin slices and place the slices on the buttered bread. Place oen lettuce leaf on each sandwich. Garnish with a large spoonful of apple celery crème and deep fried salmon skin on top of the lettuce leaf. The curing-process is quite similar to the process used for gravlax, but because you only use salt and sugar the salmon tastes lighter and fresher, like sushi or sashimi. It is vital that the salmon is super fresh, just like when you prepare sushi or sashimi. 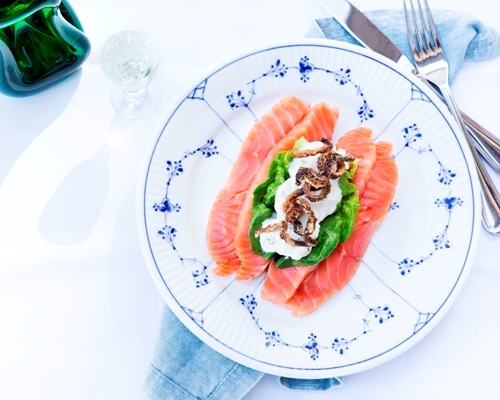 We recommend an aromatic, cask-matured aquavit, like the Madeira Aquavit from Helsingør Spritfabrikker, and a fresh, quaffable Böhmer Pilsner from local artisan brewery, Nørrebro Bryghus, for the cured salmon.